One of the highly technical and critical aspects of landscape improvement involves dry creeks, drainage, grading and sodding. These are basically geared towards ensuring that the landscape will be safe from potential accident magnets, as well as ensure the attractiveness of your outdoors. And here at Outdoor Escapes, we specialize in these projects and have actually worked on highly successful ones. If you want us to help you make your property highly conducive for relaxation, safe, appealing, and functional, then call us today. Creating dry creeks is a clever way of turning potential tragedy into your advantage. But just how is that? Well, let’s just say that if you have some slopes inside your property where soil tend to erode and then clog your drainage system down below, a dry creek will solve it like magic. 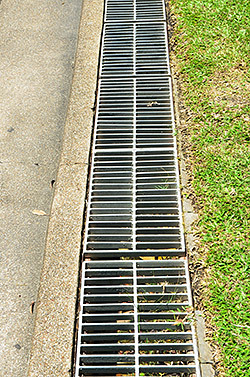 Accordingly, we can ensure that you won’t have to worry anymore about clogged drainage or damaging water runoff. Because we have built dozens of dry creeks before, you’re assured of the best-looking and most functional dry creeks possible. Using a combination of plants, pebbles, stones, and concrete, we can effectively divert water into your drainage system where it could pose no danger. Ensuring that your property has a functional and appropriate drainage system in place is critical to avoid flooding that could drown your precious plants, trees, and shrubs. The good news is that one of our areas of expertise is in building great drainage systems that will function properly all-year long. 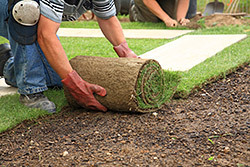 We have expert personnel who can create the drainage type that will work best in your landscape. Additionally, we have ready access to the finest drainage materials such as geo-textile fabric, combination filter fabric, and French drain materials. Whether it’s a surface or subsurface drainage system, our trained people can guarantee that you’ll enjoy a flood-free property even if torrential rains occur within your area. With a great drainage system, your property will be protected from unwanted damages due to excess water. Grading your landscape is a critical thing to do especially if your property is inherently prone to being flooded. Aside from flood prevention, it is also done for aesthetic purposes and practical reasons like creating access routes in various areas in and around your property. Accordingly, we will ensure that every grading task that must be done will be completed to achieve the best results possible. 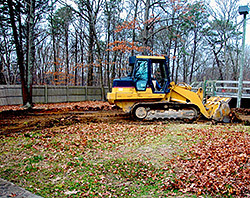 Whether it’s clearing debris, digging to create foundations, leveling slopes, or moving materials, you can expect excellent work quality from us. We have complete tools and heavy equipment to finish projects efficiently – from bulldozers and skid steers to laser level and excavators. Meanwhile, we could also perform sodding tasks for you. If you’re in dire need of a beautiful lawn within a short period, going for sods instead of seeds will do the trick. With this method, you will only pay more initially but you can expect to enjoy the benefits of a mature lawn practically within just overnight. With seeding, it will take you months, even a year, to have your lawn ready for use. Luckily, we have partners who supply us with premium sods. These sods are carefully grown using strict standards. We likewise have trained personnel who are well-versed in installing sods and preparing the area. Our rates are also very affordable and we even offer free estimate! So call us and let us handle all your dry creeks, drainage, grading and sodding needs.